NEW DELHI(ANI): Even though separatist leader Masarat Alam, who was invited for Pakistan National Day celebrations at the High Commission in Delhi refused to attend the event, Minister of state for Foreign Affairs General VK Singh and Congress Leader Mani Shankar Aiyer on Monday attended the Pakistani envoy's dinner. Singh, former Army Chief, attended the celebrations, where several Kashmiri separatist leaders including Mirwaiz Umer Farooq, Syed Ali Shah Geelani and Yaseen Malik were also present. 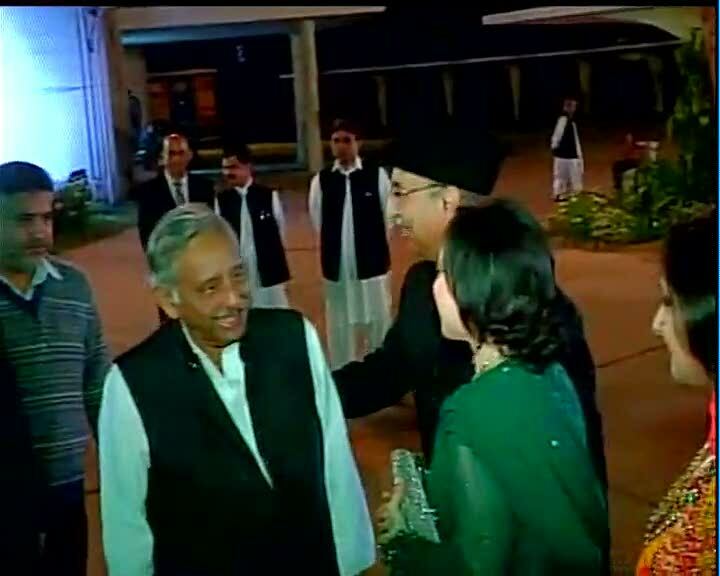 Congress leader Mani Shankar Aiyar also present. The minister stayed for 15 minutes at the reception which was held on a day India and Pakistan sparred over Hurriyat leaders' confabulations with Basit, with New Delhi making it clear that there was no role for a third party. Pak National Day: Cong leader Mani Shankar Aiyar at the Pakistan High Commission in Delhi. Speaking to media, Congress leader Mani Shankar ​Aiyer said, "Meeting between separatists and Pakistan High Commission had started during Vajpayee ji’s time, and it continued during our times. I don't think it has harmed us in any way or has assisted Pakistan in any way." Pak National Day celebrations: V K Singh at the Pakistan High Commission in Delhi. He further added, "It was foolish to break down dialogue with Pakistan on ground that High Commission met Hurriyat leaders. Hope we will show maturity to undertake uninterrupted dialogue with Pakistan without which we won't be able to resolve any issue." Pakistan High Commissioner Abdul Basit, downplaying his meetings with Kashmiri separatists today said, "I don't think Indian government is objecting. I would rather suggest my media friends not to make an issue out of a non-issue," Basit said on the sidelines of an event here to mark the Pakistan National Day. However, India said there was "no scope for misunderstanding or misrepresenting" its position on the role of the so called Hurriyat in Indo-Pak ties, making it clear that there was no place for a third party. Hitting out at Pakistan for the statement that India has no objection to invitation to Hurriyat leaders to its National Day celebrations here, Spokesperson in the External Affairs Ministry Syed Akbaruddin said, "The Government of India prefers to speak for itself". Meanwhile, against the backdrop of two back-to-back attacks in Jammu, Prime Minister Narendra Modi today told his Pakistan counterpart Nawaz Sharif that an atmosphere free of terror and violence is required for resolving all outstanding issues through a bilateral dialogue. He underlined the message to Sharif on Pakistan's National Day while greeting him in a letter. "I have written to Pakistan PM Mr. Nawaz Sharif, conveying my greetings on the National Day of Pakistan," Modi tweeted. "It is my firm conviction that all outstanding issues can be resolved through bilateral dialogue in an atmosphere free from terror & violence," he said in another tweet. Pakistan High Commissioner Abdul Basit's meetings with Kashmiri separatists and subsequent National Day celebrations invitation to them evoked sharp reaction from political leaders. "If anyone doesn't believe in Indian Constitution, then why should anyone talk to them?," said Congress leader Digvijay Singh. Another party leader and former Union Minister Anand Sharma said the Modi government should adopt a coherent and consistent approach to engage in talks with Pakistan. "Talking about our neighbours, with Pakistan or China, relationships which are sensitive, complex and sometimes there have been areas of concern, have to be integral to the foreign policy. That is why I said it has to be consistent; it has to be a roadmap. "And the Prime Minister alone knows what assurances he has given. Our concerns are about continued terror attacks," Sharma said.